China’s Tianzhou-1 space freighter has successfully docked with the Tiangong-2, the country’s orbital lab. The automatic procedure was the first in the nation’s fast-paced space exploration program. The Tianzhou-1, China’s first robotic cargo spacecraft, was launched on Thursday evening from the Wenchang Space Launch Center in south China’s Hainan Province, Xinhua news agency reported. The docking procedure was completed at 12:23pm on Saturday (04:23 GMT), the report cited the Beijing Aerospace Control Center as saying. Two more docking procedures will be conducted as part of Tianzhou-1’s mission, including one meant to test a new fast-docking technology. The ship has brought some six tons of cargo into space, including fuel for resupplying the space station and material for stem cell experiments. Unmanned freighters are crucial to maintaining a permanently manned orbital station, which China plans to accomplish in 2022. 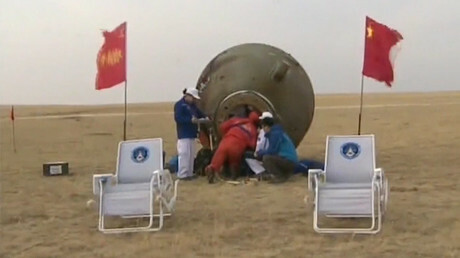 The Tiangong-2 served as home to two Chinese explores during a month-long mission in October of last year, but is currently uninhabited. China chose to develop an independent space program rather than take part in international cooperation on the International Space Station, which is dominated by the US and Russia, the world’s two leading space-faring nations. It is rapidly closing the technological gap, however.